The laptop is in the shop, so my on-line time is limited to office time. While I’m in the office the next few weeks I’m working on sermons. I’ll be preaching on the “presbyterian” son, actually the 2 ways to run from God (yes, I’ve been listening to a lot of Tim Keller as I’ve driven to supply pulpits the last 3 Sundays). I see Winter Haven as an older son kind of town. People are generally good and decent and this obscures their perception of any need for Christ and His righteousness. But we tend to preach as if they are all reckless, rebellious sons. Perhaps this is why the Reformed churches here are not bearing a whole lot of fruit (in addition to the consumer-mindset-satisfying churches). There are a few other projects I’m working on as well, which limit my time in the office. One of these days I’ll replace the resistor for the A/C fan in my car too. It comes up in every interview: what happened, why did the church close? I understand that question and answer it as best I can. Many things contributed to the final result. More than I could probably list. But it feels like picking at a scab, keeping it from healing. For some, the stigma is too much. Tainted goods. They can’t see the fact that this happened after 9 years of service and perseverence. I know, I’ve had these conversations. The bottom line is we have all failed. Some of our failures are little known or very common. Who didn’t fall off their bike? But most of us got back on and tried again. Some of our failures are bigger, and less common. As a result some people crawl into a hole and give up. Some learn and try again. Terry Francona failed. Yep, he of the 2 World Series championships in 4 years as manager of the Red Sox. His first managerial job in Philly was a failure. When he was hired by Theo I thought “what are they thinking?” But they saw something all Red Sox fans who now sing his praises missed. Such a failure is the result of many factors. Sometimes it really is about being the right guy in the right place at the right time. And failure is one of those things being wrong. You have the skills, but you are in the wrong place at that time. I heard of a church planter who planted 2 very successful churches. We are talking about one that was over 1,000 and another over 500. His third church plant only grew to about 150. Most people would consider that a success. He considered it a failure. He never planted another church. He missed the point, and made numerical success an idol (I think). Me? I’m looking for another chance. I believe in the God of second chances. The God who didn’t give up on Moses, Abraham, David, Peter, Paul, Mark and so many more. Failures all! But by the grace of God they tried again and eventually were the right guy in the right place at the right time. So I wait for the right place at this time. And I trust the Spirit will work so some group of people will say “this is the guy God wants for us”. There are people who will look beyond failure to see how it shapes a person, prepares a person, humbles a person. Maybe it is because they too failed at something important. The big news out of Ft. Myers is not the arrival of the ever-expanding Bartolo Colon. Apparently he thinks he’s reporting to Angels’ camp, since his travel bag is one of theirs. The really big news, from my perspective, is the development of Dice-K and Clay Buchholz. Last year had to be a difficult year for Dice-K, with all the adjustments and half the Japanese media following his every move. The “Man of a Million Pitches” has added another pitch. No fancy name, like Okajima’s new “Doki Doki”. Sounds like a live 2 seam fastball. But he isn’t really talking about it. His teammates are talking about his stuff though after a 40 pitch session in which he got J.D. Drew to miss completely on 3 straight pitches. And so was his pitching coach, Farrell. The young kid, on the other hand, faced Papi, Manny and Lowell. And they were raving about him. Beckett seems to have picked up where he left off. The starters for the Red Sox look formidable. Consider the line-up too. You probably won’t get the same production out of Mike Lowell, but Papi’s power #s were down due to the newly-repaired knee, Manny had an off year and looks to be in fantastic shape, Drew and Lugo had off years too. If Drew regains his end of the year momentum (when he stopped standing in the troughs dug my Papi) they can match Detroit’s lineup. 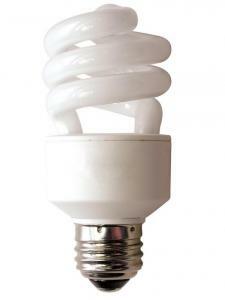 The push is on to get you to buy and use compact flourescent bulbs. They do use less energy. But it is reductionistic to have that as the one criteria. As one who worked in the men’s department of a store as a teenager, they make colors appear differently than they do in natural light. Not a huge concern, but here is one that should be a huge concern. Keep people and pets away. Open windows, and leave the area for 15 minutes before beginning the cleanup. Do not use a vacuum cleaner, even on a carpet. This will spread the mercury vapor and dust and potentially contaminate the vacuum. Carefully remove the larger pieces and place them in a secure closed container, preferably a glass jar with a metal screw top lid and seal like a canning jar. Next, scoop up the smaller pieces and dust using two stiff pieces of paper such as index cards or playing cards. Pick up fine particles with duct tape, packing tape, or masking tape, and then use a wet wipe or damp paper towel. Put all waste into the glass container, including all material used in the cleanup. Remove the container from your home and call your local solid waste district or municipality for disposal instructions. Continue ventilating the room for several hours. As a precaution, consider discarding throw rugs or the area of carpet where the breakage occurred, particularly if the rug is in an area frequented by infants, small children or pregnant women. Otherwise, open windows during the next several times you vacuum the carpet to provide good ventilation. SOURCES: Maine Bureau of Remediation and Waste Management; Mercury Policy Project Article copyrighted by the Globe Newspaper Company. The bottom line: these things are dangerous for your health and the environment. Some states do not permit you to put intact bulbs in the trash because they can obviously break, and spill mercury (imagine hundreds and thousands of these breaking in your local landfill). Which is a greater threat to us, carbon gases or mercury? Pick your poison. We sang this one 2 Sundays ago, and it fit in very well with my sermon. And for my place in life. It is on Chris Tomlin’s most recent album See the Morning, but was written by Brenton Brown and Ken Riley. The song is Everlasting God, and it is a mediation on Isaiah 40. We will wait upon the LordWe will wait upon the Lord. You do not faintYou won’t grow weary. This song has some great truths to keep in mind as you wait upon the Lord. He does provide strength as we wait. Our God does not change, and that means he continues to reign and continues to deliver his people from earthly and eternal trials. Though we grow faint and weary, he does not. Instead he continues to defend the weak and comfort us in our times of need. In due time, we will be lifted up. Some great truth to ponder while we wait. And singing it helps! Keith and Kristyn Getty (along with Stuart Townend) are among some of the best worship song writers today. They write music that bridges the gap between traditional hymns and modern worship with what has been called “modern hymns”. This is what I like to hear from a musician- he senses a great need to be responsible for properly shaping the life of churches. Music does affect us emotionally, and so should worship. It is best to have our emotions stirred by deep truth (Edwards would call this religious affections). The best church music stirs hearts AND minds. It is more than the “personal worship experience”, but corporate worship- adoring Christ together as the One who has brought us together in union with Himself by faith. Kristyn talks about how they work with pastors and theologians so they don’t go astray theologically. What a great idea! It also shows great humility on their part. They are the type of songwriters we need (and there are others out there) producing music for the church to use in its times of public worship. You might want to check out the rest of interview. It is hard to believe that CavSon has been here more than 3 weeks. It is nearly time for our 30-day evaluation. He has made some great progress. In the past couple of days we have noticed that he is beginning to imitate our speech. His English vocabulary is slowly expanding, but expanding it is. We are very excited about this. There is the standard “bye”, Elmo, ma-ma, hello there, there you go, and who knows what else we’ve missed because of the cleft palate. Even better- his green card arrived in the mail today! Next week we begin another round of paperwork as a result.